김정은 상황 판단 빠르고 똑똑하다 - Newspro Inc.
북의 젊은 지도자인 김정은 위원장이 상황 판단이 빠르고 똑똑하다는 외신의 보도가 눈길을 끌고 있다. 문재인 대통령을 비롯해 미국 오바마 전 대통령 등의 인터뷰 기사를 내보내기도 한 싱가포르에 본사를 둔 유력 방송인 채널뉴스아시아(CNA)는 25일 ‘Kim Jong Un, the modern, strange and brilliant leader of North Korea-현대적이고, 이상하며, 뛰어난 북한 지도자 김정은’이라는 제목의 스티븐 브로윅의 논평을 내보내며 김 위원장이 스위스 유학을 경험해 어린 나이에 북의 지도자가 되었을 때 많은 사람들이 김 위원장이 북을 점차 개방시킬 것이라고 내다봤다고 소개했다. 이 논평은 김 위원장의 북한에서의 권력 공고화 과정을 소개한 뒤 핵실험과 미사일 발사를 통해 세계의 시선을 주목시킨 시킨 김 위원장이 전쟁 가능성에 대한 두려움이 정점을 향해 치닫고 있을 때 평창 동계올림픽참가와 미국 대통령과 북한 지도자 사이 역대 첫 정상회담, 2007년 이래 첫 남북 정상회담에 참가하면서 서울 및 워싱턴에 호의적인 태도를 보여주었다고 극적인 반전과정을 되짚었다. 논평은 김 위원장은 자신의 통치 첫 몇 년간을 북한 외부로 알려진 방문 없이 보낸 후, 이 외교적인 혼란을 통해 자신감 있는 정치인으로서 면모를 보여주었다고 평가했다. 채널 아시아는 김 위원장이 트럼프와의 회담에서 핵무기를 포기하겠다는 자신의 의지를 포명했다고 전해진다며 김 위원장은 구체적으로 명시하지는 않았지만 비핵화의 대가로 미국의 “상응하는 조치”를 조건으로 요구해왔으며, 결국 주한미군 철수로 이어질 수 있는 한반도 비핵화에 대해 말해왔다고 주목했다. 이 논평은 향후 몇 달 간 김 위원장은 트럼프 대통령과 문재인 대통령과의 정상회담이 잡혀 있다는 점을 상기 시킨 뒤 이를 통해 앞으로 김 위원장이 진정으로 북한이 국제사회의 온전한 구성원이 될 핵 없는 미래를 바라는지, 아니면 현재의 평화적 공세가 단지 제재 완화를 얻어내어 경제 발전을 도모하려 함인지 보게 될 것이라고 내다봤다. 또한 김 위원장은 인민들의 생활수준을 높여야 한다며 이를 달성하기 위해 김 위원장은 자신이 진정으로 비핵화를 의도한다는 사실을 어떻게든 전 세계로 하여금 믿게 하는 일과, 양보를 얻어내지 못할 경우 자신의 약속을 철회할 수 있는 여지를 남겨 두는 것 사이에 균형을 잡는 어려운 일을 해내야 할 것이라고 예상했다. 나아가 이 모든 일을 추진하면서 김 위원장은 북한 인민들 눈에 한국이나 미국에 굽신거리는 것처럼 보이는 것은 피해야 할 것이라고 북의 자주적인 입장을 애둘러 전했다. 이 논평은 마지막에 김정은 위원장은 그의 집권 초기 모든 사람들이 예상했던 것보다 더 상황 판단이 빠른 지도자임이 입증되었다. 그러나 균형을 잡아 상황을 헤쳐나가는 이 일은 김정은 위원장에게조차 아주 힘들 것으로 보인다고 전망했다. 싱가포르에 본사를 둔 채널뉴스아시아(CNA)는 아시아 지역 내 22개국에서 약 7천만 가구가 시청하고 있는 영향력 있는 뉴스전문 영어 방송이다. 다음은 뉴스프로가 전문 번역한 채널 아시아의 논평이다. Kim has proved to be a shrewder leader than anyone expected when he took power, says Steven Borowiec. 김 위원장이 권력을 잡았을 당시 기대되었던 것 이상으로 상황 판단이 빠른 지도자임을 보여주었다고 스티븐 보로윅은 말한다. 북한 지도자 김정은과 김정일의 이미지를 담은 우표가 2018년 1월 20일 러시아 모스크바의 현대미술관(UMAM)에서 열리는 “Made In North Korea” 전시회에서 선보이고 있다. SEOUL: When Kim Jong Un took over leadership of North Korea in late 2011, after the death of his father, the reclusive, eccentric dictator Kim Jong Il, he inherited the throne while still believed to be in his twenties, with little to no experience in governance. 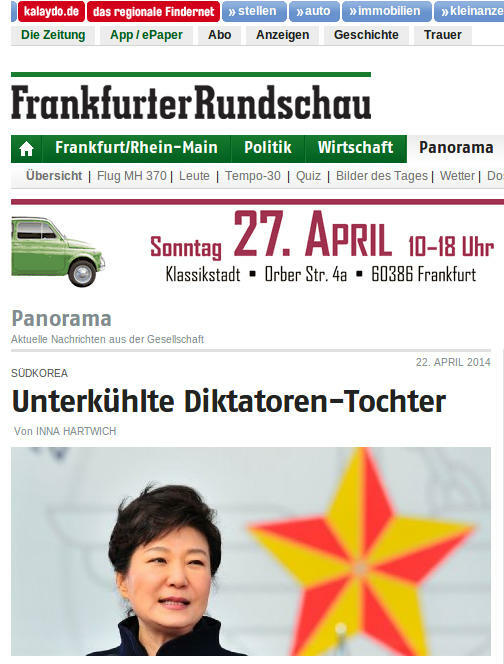 서울: 2011년 말, 은둔형의 괴짜 독재자인 아버지 김정일의 죽음 이후 김정은이 북한의 지도자가 되었을 때, 그는 국정운영에 대한 경험이 거의 없거나 전혀 없이 아마 아직 20대의 나이로 왕좌를 물려받게 되었다. Of what little was known about Kim, many observers drew attention to years of his youth spent studying in Switzerland, and a reputed affinity for NBA basketball. 김 위원장에 대해 알려진 바가 거의 없긴 하지만 그를 지켜보는 많은 이들은 그가 스위스에서 공부하며 보냈던 유년기 시절과 세간에 잘 알려져 있는 NBA 농구에 대한 그의 관심에 주목했다. 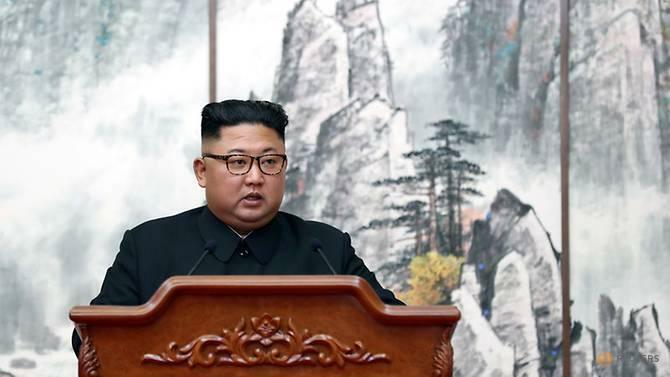 Those details led many observers to speculate that North Korea finally had its reformer, that the young Kim would open his country’s economy in a manner similar to China under Deng Xiaoping. 이러한 사실들 때문에 많은 관찰자들은 북한이 마침내 개혁적인 지도자를 갖게 되었으며 젊은 김 위원장이 덩샤오핑 체제 하의 중국과 유사한 방식으로 북한의 경제를 개방할 것이라고 추측했다. 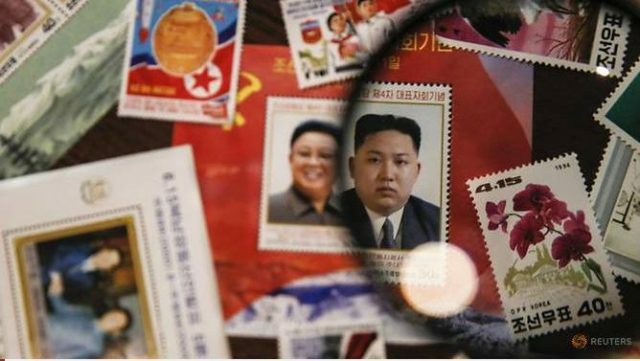 Having tasted life in a free, rich society, it seemed to follow that Kim would bring his country out of isolation, gradually lifting the restrictions on movement of people and information both into and out of North Korea. 자유롭고 풍요로운 사회에서의 삶을 맛본 김 위원장이 북한으로 들어오고 나가는 사람들과 정보의 움직임에 대한 제한을 점진적으로 해제시키면서 북한을 고립으로부터 벗어나게 할 것은 그럼직해 보였다. 북한의 지도자 김정은과 그의 부인 이설주, 그리고 미국의 농구 스타 데니스 로드맨이 평양에 있는 평양체육관에서 전 NBA 선수들과 북한 선수들 사이의 농구 게임을 관람하고 있다. But instead of opening his country, Kim’s first few years at the helm featured a series of purges in the upper ranks of North Korea’s government to solidify his grip on power, violently eliminating anyone he perceived as a threat, including his uncle by marriage, who was dragged out of a large meeting as an apparent warning to anyone else with ambitions of challenging the young Kim’s control of the country. 그러나 북한을 개방하는 대신, 김 위원장이 지도자로 있던 첫 몇 년은 자신의 지배력을 공고히 하기 위해 북한 정부의 고위 관료들을 연달아 숙청하는 것으로 점철되었으며, 그가 위협적인 존재라고 여기는 인물은 누구든지 가차없이 제거되었다. 이 중에는 젊은 김 위원장이 북한을 지배하는 것에 도전하고자 하는 야망을 지닌 이들 누구에게나 명백한 경고가 되었던 사안으로서, 대규모 회의 도중 끌려나간 자신의 외숙부도 포함되어 있다. He also increased security along North Korea’s border with China to limit the number of North Koreans who defect to South Korea. 그는 또한 한국으로 탈북하는 북한 주민들의 수를 제한하기 위해 북한과 중국 사이 국경의 안보를 강화하였다. Once he felt secure, Kim began to consider his country’s position in the international order. 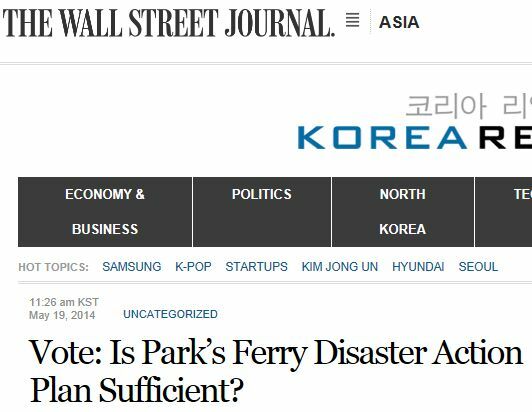 As a small, poor country, North Korea needed to do something to build a profile that more powerful countries would take seriously. 그가 안전하다고 느끼고 나자, 김 위원장은 국제 질서 속에서 북한의 위치를 고려하기 시작했다. 작고 가난한 나라인 북한은 강대국들이 진지하게 받아들일 만한 프로필을 쌓기 위해 무엇인가를 해야만 했다. Starting in 2016, North Korea stepped up its nuclear and missile testing, conducting more frequent tests than at any previous point in the country’s history. The country conducted three nuclear tests between 2006 and 2013; three tests were conducted just in 2016 and 2017. 2016년부터 시작해서, 북한은 북한 역사상 어느 시점보다도 더욱 빈번한 실험을 하며, 핵과 미사일 실험을 강화했다. 북한은 2006년부터 2013년에 걸쳐 세 차례 핵 실험을 했는데, 2016년과 2017년 단 2년 동안 세 차례의 실험을 진행했다. The development of ever-more threatening weapons earned the world’s attention and made many wonder if Kim planned to carry out an attack, on either South Korea or the US. 점점 더 위협적인 무기 개발은 세계의 관심을 불러일으켰고 많은 이들은 김 위원장이 한국이나 미국을 공격할 계획인지에 대해 궁금해했다. But just when fears over a possible war were peaking, Kim changed his tone. 그러나 전쟁 가능성에 대한 두려움이 정점을 향해 치닫고 있을 때, 김 위원장은 자신의 어조를 바꾸었다. 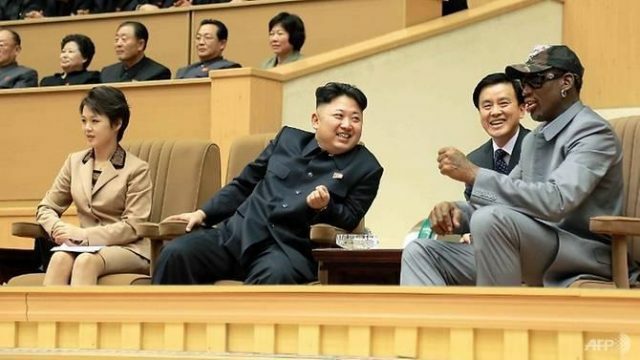 After agreeing to take part in the Winter Olympics in South Korea in February, Kim made nice with Seoul and Washington, participating in the first-ever summit between an American president and a North Korean leader, and the first inter-Korean summit since 2007. 김 위원장은 2월 한국에서 열리는 동계 올림픽에 참가하기로 동의한 후, 미국 대통령과 북한 지도자 사이 역대 첫 정상회담과 2007년 이래 첫 남북 정상회담에 참가하면서 서울 및 워싱턴에 호의적인 태도를 보여주었다. Kim and South Korean President Moon Jae-in have now held four meetings, and there are tentative plans for another US-North Korea summit in early 2019. 김 위원장과 한국의 문재인 대통령은 현재 네 차례의 회담을 진행했으며, 2019년 초 다시 한 번 북-미 정상회담을 위한 잠정적인 계획을 가지고 있다. 김정은 위원장은 동계 올림픽을 앞두고 적시에 한국의 문재인 대통령에게 다가왔고, 이들은 2018년 4월 역사적인 정상회담을 가졌다. 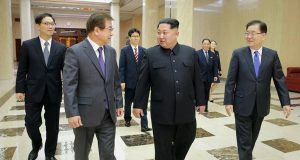 Throughout this diplomatic flurry, Kim has come across as a confident statesmen, after spending the first several years of his rule making no known trips outside of his country. 김 위원장은 자신의 통치 첫 몇 년간을 북한 외부로 알려진 방문 없이 보낸 후, 이 외교적인 혼란을 통해 자신감있는 정치인으로서 면모를 보여주었다. 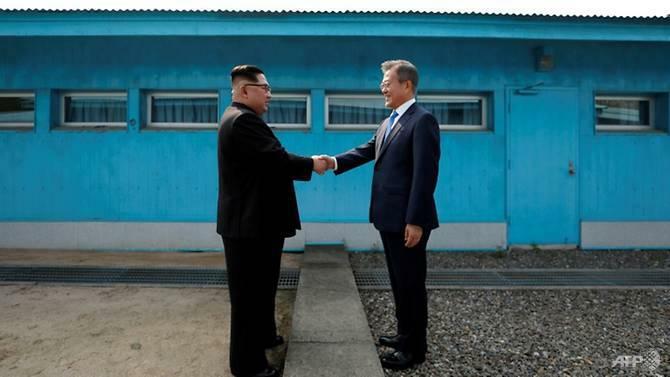 He quickly built a brotherly rapport with South Korean President Moon Jae-in, and the two tugged at the heartstrings of Koreans in April when, on the day of their first summit, they held hands as they walked on both sides of the heavily-guarded that separates their countries, sending the implicit message that, through cooperation, they could find a way to end inter-Korean division. 그는 한국의 문재인 대통령과 형제같은 관계를 빠르게 구축했으며, 두 정상은 4월 첫 정상회담이 있던 날 한국인들의 마음을 깊이 감동시켰다. 그들은 남과 북을 가르는 양쪽의 삼엄한 경비 구역을 걸으며 손을 붙잡았으며, 협력을 통해 남북 분단을 종식시킬 방법을 찾을 수 있을 것이라는 함축적인 메세지를 보냈다. He has also had a number of friendly interactions with Donald Trump, and both men have spoken to having a productive, mutually-respectful relationship. 김 위원장은 트럼프 대통령과도 많은 우호적인 교류를 해왔으며, 자신들이 생산적이고 상호 존중하는 관계를 가지고 있다고 두 사람 모두 말해왔다. In those meetings, Kim reportedly expressed willingness to give up his nuclear arsenal, albeit with caveats that sometimes get glossed over in media coverage. 비록 언론 보도에서 때로 대충 얼버무렸다는 경고가 있긴 하지만, 회담에서 김 위원장은 핵무기를 포기하겠다는 자신의 의지를 표명했다고 전해진다. He has stipulated unspecified “corresponding measures” from the US in exchange for denuclearisation, and has talked in terms of denuclearisation of the Korean peninsula, which could entail pushing for the withdrawal of US troops from South Korea. 김 위원장은 구체적으로 명시하지는 않았지만 비핵화의 대가로 미국의 “상응하는 조치”를 조건으로 요구해왔으며, 결국 주한미군 철수로 이어질 수 있는 한반도 비핵화에 대해 말해왔다. World leaders’ actions on the global stage are nearly always motivated by domestic concerns, and in that regard, Kim is not different from his counterparts in more normal countries. 세계 무대에서 세계 정상들의 행동은 거의 항상 자국내의 우려되는 문제들에 의해 영향을 받는다. 그러한 점에서 김 위원장 역시 많은 일반적인 국가들의 정상들과 다르지 않다. 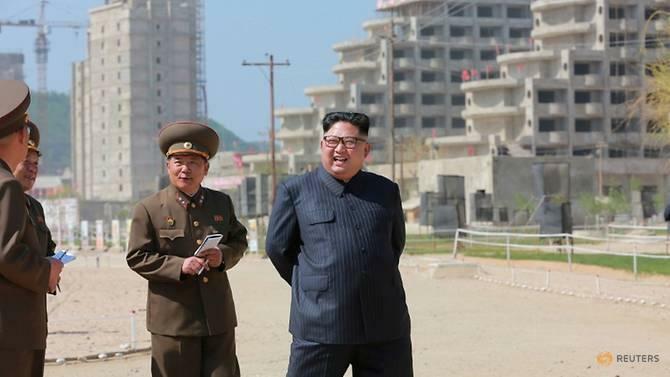 In recent months as Kim has embarked on his international coming out, the North Korean media has allocated ample space to another story, one that is just as important for Kim: The ongoing construction of a tourism zone in Wonsan, a city on North Korea’s east coast. 최근 몇 달 동안 김 위원장이 국제 무대에 본격적으로 나서기 시작하면서 북한 언론은 김 위원장에게 마찬가지로 중요한 또하나의 소식에 많은 시간을 할애해왔다. 북한 동부에 위치한 도시 원산에 현재 건설되고 있는 관광단지에 대한 소식이다. 조선중앙통신이 배포한 날짜를 밝히지 않은 이 사진에서 김정은 위원장이 “원산 갈마 해양 관광지역”의 건설 현장을 시찰하고 있다. Kim has visited the site a few times since the spring, and on his most recent visit, decried international sanctions on North Korea and how they were holding back development in Wonsan, and in the North’s economy in general. 김 위원장은 봄부터 여러 차례 그 현장을 방문했고 가장 최근의 방문에서 국제 사회의 대북제재를 비난하며, 이 대북제재가 원산 개발, 더 나아가 북한 경제 전반을 얼마나 더디게 하고 있는지 말했다. Over the next few months, Kim is scheduled to hold more summits with both Trump and Moon. 향후 몇 달 간 김 위원장은 트럼프 대통령과 문재인 대통령과의 정상회담이 잡혀 있다. We will get to see if Kim genuinely does see a nuclear-free future where North Korea is a fully integrated member of the international community, or if his current peace offensive is merely intended to win him sanctions relief to push forward with economic development. 우리는 앞으로 김 위원장이 진정으로 북한이 국제사회의 온전한 구성원이 될 핵 없는 미래를 바라는지, 아니면 현재의 평화적 공세가 단지 제재 완화를 얻어내어 경제 발전을 도모하려 함인지 보게 될 것이다. Kim’s heavy-handed tactics early in his tenure won him stability, but that won’t last forever. 김 위원장의 집권 초반의 엄중한 정책들은 안정을 가져왔지만 이는 영원히 지속되지는 않을 것이다. Compared with his father’s era, many more North Koreans today are aware that their country is exceptionally poor, and to last, Kim will have to raise living standards. 김 위원장 부친의 시대와 비교해 보면 현재 훨씬 더 많은 북한 인민들이 자신들의 조국이 대단히 빈곤하다는 사실을 알고 있기에 정권 유지를 위해 김 위원장은 인민의 생활 수준을 높여야만 할 것이다. To accomplish that, Kim will have to strike a difficult balance in somehow managing to convince the world he sincerely means to denuclearise, while leaving himself room to renege on that promise if he fails to win concessions. 이를 달성하기 위해 김 위원장은 자신이 진정으로 비핵화를 의도한다는 사실을 어떻게든 전 세계로 하여금 믿게 하는 일과, 양보를 얻어내지 못할 경우 자신의 약속을 철회할 수 있는 여지를 남겨 두는 것 사이에 균형을 잡는 어려운 일을 해내야 할 것이다. 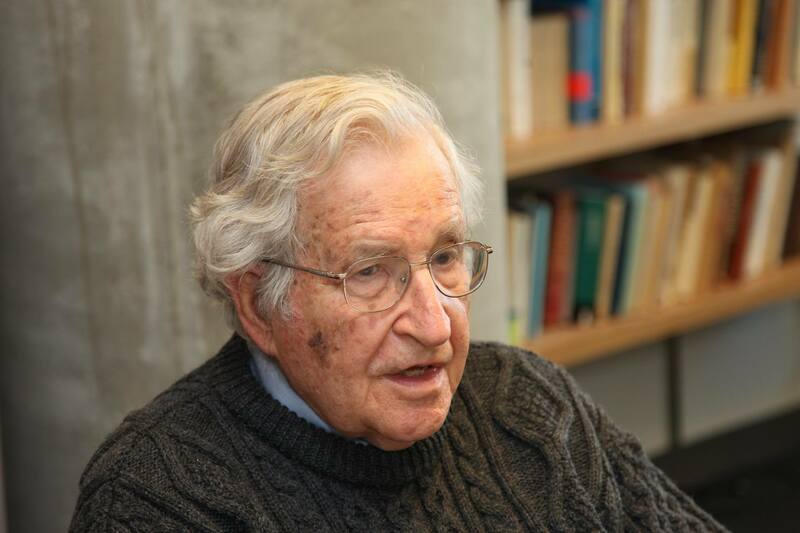 For his audience at home, he will also have to avoid appearing beholden to either South Korea or the US. 김 위원장은 또한 북한 인민들 눈에 한국이나 미국에 굽신거리는 것처럼 보이는 것은 피해야 할 것이다. 2018년 9월 19일 평양에서 김정은 위원장이 공동기자회견에서 발언하고 있다. There is no good reason to believe that Kim intends to negotiate away his country’s nuclear weapons, or that he longs to be the reformer that will open North Korea to the outside world. 김정은 위원장이 협상 과정에서 북한의 핵무기를 포기해 버리려 한다거나 북한을 외부 세계에 개방할 개혁주의자가 되기를 갈망한다고 믿을 만한 타당한 근거는 없다. Even under Kim, North Korea has stuck to its ideology of limiting outside influences. 김정은 정권에서도 북한은 외부 세계의 영향력을 제한하는 이데올로기에 빠져 있다. Kim now faces the challenge of finding a way to improve the economy, with or without sanctions relief, while keeping both Washington and Seoul credulous that he has good intentions. 현재 김 위원장은 자신이 좋은 의도를 가지고 있다는 것을 미국과 한국이 계속 믿게 만들면서 제재완화가 되든 안 되든 간에 북한 경제를 발전시킬 방법을 찾아야 하는 난제에 직면하고 있다. Kim has proved to be a shrewder leader than anyone expected when he took power, but this balancing act is likely to prove too difficult, even for him. 김정은 위원장은 그의 집권 초기 모든 사람들이 예상했던 것보다 더 상황 판단이 빠른 지도자임이 입증되었다. 그러나 균형을 잡아 상황을 헤쳐나가는 이 일은 김정은 위원장에게조차 아주 힘들 것으로 보인다.